Carey looked at me funny when I said that. He said “Well if you’ve got the time, come on over. We walked to his truck and I realized why he wasn’t worried about the letters getting wet. I was expecting old correspondence. What he had was OLD LETTERS. The truck bed was full of beautiful red metal letters from a defunct neon sign. The S was the largest one. He pulled out a P and tossed it onto the grass. 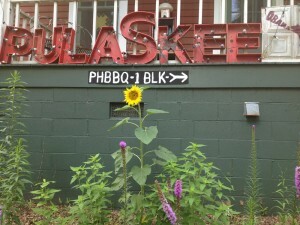 The P was joined by the U, followed by L A S K —–and then we ran into trouble. “What letter you need now Charlie?” said Carey. The rain was starting to fall. It was a hot summer evening and the mosquitoes were eating us up, but we didn’t care. Phyllis held the four by four steady and Carey hammered the K flat against the ground. We carried the letters to the house and after the rain was done I got busy.